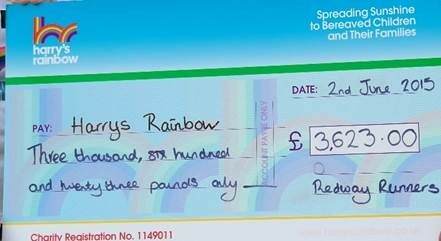 Milton Keynes community running club Redway Runners are proud to announce that club Chairman Martin Lawrence presented a cheque for £3,623 to Harry’s Rainbow (www.harrysrainbow.co.uk), a local charity which supports families who have suffered the loss of a child. 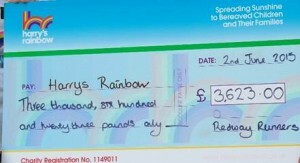 The presentation was made at Wolverton Pool on 3 June and was followed by a joint run by Harry’s Rainbow and Redway Runners members. Redway Runners members attending the club AGM vote for a charity that the club will support for a year. During the year, profits from club events and raffles are set aside for the charity contribution at the end of the year. The 2015/2016 chosen charity is “Bravery Boxes” (www.braveryboxes.com). Bravery Boxes brings a little joy and lifts the spirits of children who need it most. They raise money to fill the ‘Bravery Box’ with little prizes for children with cancer to delve into when they have to endure painful or upsetting procedures. This tiny distraction can make all the difference to a distressed child (or sibling).